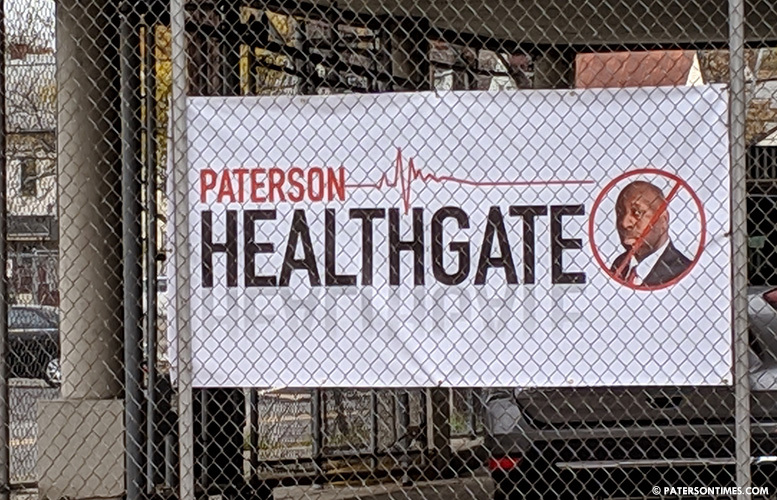 A controversial banner that hung outside of the Paterson Education Association building targeting district business administrator Richard Matthews, blaming him for the problems that emerged as the school system transitioned out of the state plan to a self-insurance program, has been taken down. The poster appeared on the Straight Street building in late October. It had disappeared on Thursday. McEntee faced criticism from school board member Emanuel Capers for installing the banner. Capers criticized the union for turning Matthews into a “scapegoat,” arguing some of the school board members – Oshin Castillo, Manny Martinez, Nakima Redmon — the union supported in the recent election had voted in favor of dropping out of the state plan. Capers said the union should have had the pictures of all school board members who voted in favor on the banner as well. He also injected a bizarre racial argument by stating the banner reminded him of things that occurred in the 1960s. He tried to get the Paterson NAACP involved in the matter. McEntee has slammed Capers and threatened him with a fresh round of ethics charges. Capers said Matthews should not be the scapegoat. Matthews proposed the switch to a self-insurance program in late 2017 to save money for the district. McEntee immediately opposed the proposal. Over the summer, the district switched more than 3,000 employees to the new program. Hundreds of teachers were denied medical procedures as a result of the switch, prompting McEntee and union leaders to criticize Matthews. McEntee said the main reason the banner was taken down was because superintendent Eileen Shafer is coming out with a written plan to address the current issues. “More than that, the Superintendent has now personally intervened on many of the largest issues and has agreed to work on all issues for members as they are reported to the PEA. Most importantly, members are reporting bills are now being paid and the Super intends to address this in her plan,” said the union president. The union may re-install the banner if the district fails to keep its promise to address the problems. “What I can promise is that should my members continue to be denied lifesaving medical procedures, not only will the banner go back up, but the next banner will have additional District officials as well, including Emanuel Capers,” said McEntee. Paterson Teachers deserve better . Union president is only sticking his neck out for members and Emanuel can handle the Heat . Put banners everywhere till you get what you want . You're the same guy who sticks up for the corrupt do nothing police lol. You must be on the gravy train as well. The teachers deserve nothing. They are overpaid hacks who barely "work" six months out of the year, get ridiculous salaries for basically doing nothing, plus a fat pension and healthcare paid for by people who actually work for a living, and meanwhile the kids can barely read and write. Give the money to the charter schools, let that fat bloated McEntee go out and get a real job instead of sucking at the teat of the teacher's dues, thanks to President Trump the economy is booming so even a do nothing hack like McEntee should easily be able to find a real job. If you can read or write, thank your teachers. I was lucky enough to go to a private school. They don't socially promote there you have to earn your grades. Thanks for playing. Oh please, Emmanuel Capers played back door politics by instigating an issue of race. Race baiting to gain support is disturbing, and unprofessional cowardly act. It goes without question the deal was lousy. So what Mr. Matthews is a native Patersonian and a product of the Paterson Public Schools. Is Mr. Capers suggesting that Mr. McEntee not fight for teacher's medical rights? He should stop playing identity politics and do what's best for Paterson like stepping down from the board because as he stated, "As always I speak for myself and not behalf of the board."